We manufacture and sell a wide range of personalised back to school name labels that are suitable for all types of school uniform clothing, our name labels are also suitable for nursery children and care home residents. Our personalised name labels are made from super soft double side satin ribbon and are available in several common sizes including both 10mm and 25mm, larger size labels also allow you to print additional optional contact and/or medical information in case the child becomes lost or is injured etc. All of our name labels are fade free, durable and longer lasting compared to simliar looking traditional products and we offer a greater level of personalisation options. Such personalisation options include 10+ fonts, 20+ solid print colours (full colour if needed) and 50+ optional motifs that add a special little touch. 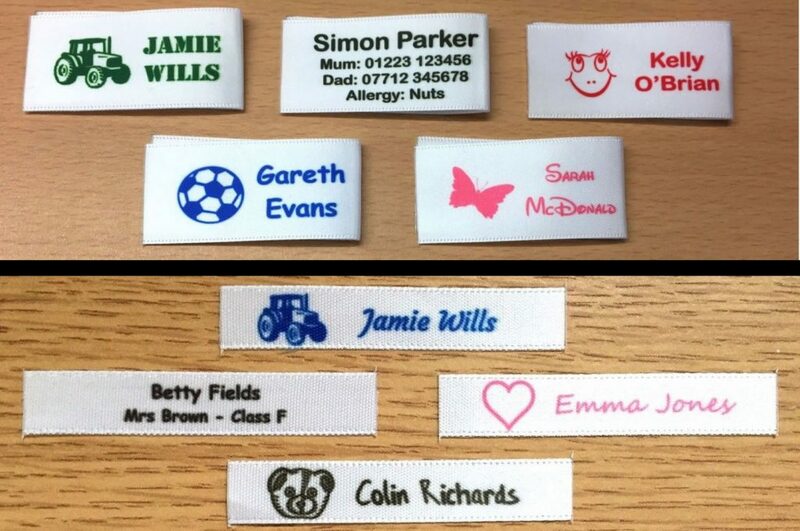 We make all of our personalised name labels at our Cambridge UK production facility using a bespoke in house developed process and that allows us to produce labels that do not fade even when washed in both bio/non-bio washing detergents and in very hot 100c+ temperatures (ideal for care home residents). In fact we have even tested our personalised name labels in concentrated bleach with no adverse effects, this makes our labels ideal for the every day washing of school uniforms. Over the years we have sold literally thousands of personalised name labels for many back to school children and have hundreds of happy customers, our feedback reflects this. When it comes to ordering name labels from us it’s an easy process and if need we will provide you with a preview before production starts, your label order is then sent in secure safe packaging and shipped via a prompt service e.g. Royal Mail 1st as we know how important it is that you get your name labels quickly etc. If you would like to find out more about our back to school personalised name labels please visit one of the links below.